We have met Captain Cook several times here at the salon. 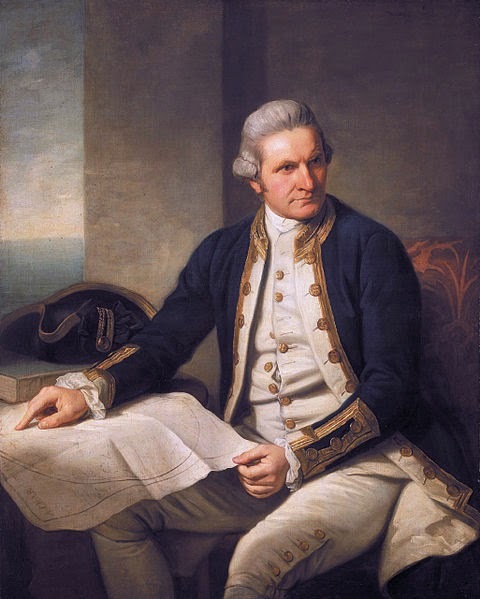 Here we have read of his trips to Botany Bay and Possession Island, learnt the story behind a famed portrait and even been present at his most gruesome death. Today we welcome the good Captain once more and though this story might have been one of another landing on foreign soil, Cook found his plans beaten by weather and tide. In November 1778, Cook's ship, HMS Resolution, was continuing her second voyage under the Captain's command. The eventful expedition had been underway since July 1776 and would, of course, be Cook's last adventure though for now, he knew nothing of the fate that awaited on Hawaii. this was a voyage of exploration, a time to discover new lands and, in particular, the famed Northwest Passage. After a difficult voyage beset with illness and problems with their vessel, the crew of the Resolution spotted land on 26th November 1778. As the first Europeans to lay eyes on Maui, Cook resolved to land there and explore but found his plans vexed by nature itself. With no natural harbour and high waves, he eventually had to face defeat and abandon his plans to land. With no other option he sailed onwards, leaving Maui so that another might one day make the first landing. That day would not come until nearly ten years later and the first European to set foot on Maui was French explorer, Jean-François de La Pérouse. He arrived on the island in May 1786, by which time Captain Cook was dead, though his name and voyages were anything but forgotten. I would love to see that; one for the wish list! I love the portrait; can't imagine anyone painting in such detail these days. Reading this has whetted my appetite, and I must now go and read the others :) Well, it beats waiting for a bus in the pouring rain to go to Morrisons. I'm glad you enjoyed it, and thank you again for guesting this week!